In the series of Theme Parties, here is one of the nicest themes for you ladies, 'Arabian Nights' or 'Sham-e-Arab'. Decoration : Create a lovely ambiance of the party hall with the low seating arrangement. Place attractive silky cushions. Shimmer the lights. Chandeliers surely add to the beauty. Genie lamps are a wonderful piece of decoration. Hukka pots will enrich the ambience. You can use Harem pants to give this look. Team it up with black or golden colored blouse (or top) with net sleeves. And cover the face with a scarf preferably of net. If you want to add more drama to the costume stitch a golden colored lace on the seam(edge). If you do not have harem pants, patiala salwar which gives a similar kind of effect can also be worn. Do loud eye make up with lots of Kajal, mascara..etc.Tie a head band and a waist band and you are good to go! Games : Divide the guests into groups of 4-5 members each. 1. Play some arabic songs and ask them to perform with bollywood moves to the song. It will be real fun. 2. Play some bollywood(completely mismatch) songs and ask them to perform belly dance to that tune. 3. 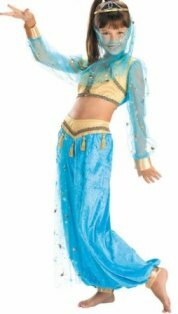 Dress a lady in Arabian outfit clad with maximum jewelry. Let her walk the ramp swiftly. The guests should write down the names of the jewelry as much as they can recall after she has gone. The one with the lengthier list wins.